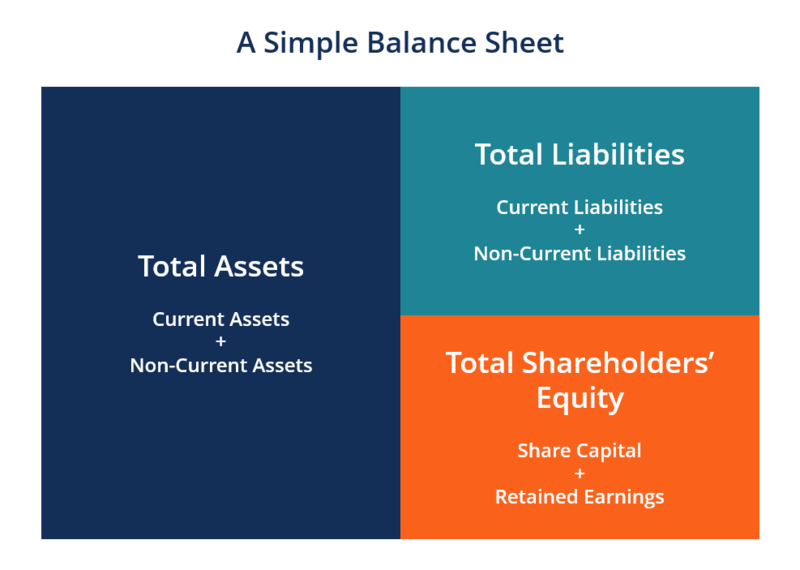 The balance sheet is one of the three fundamental financial statementsThree Financial StatementsThe three financial statements are the income statement, the balance sheet, and the statement of cash flows. These three core statements are intricately linked to each other and this guide will explain how they all fit together. By following the steps below you'll be able to connect the three statements on your own. and is key to both financial modelingWhat is Financial ModelingFinancial modeling is performed in Excel to forecast a company's financial performance. Overview of what is financial modeling, how & why to build a model. A 3 statement model links income statement, balance sheet, and cash flow statement. More advanced types of financial models are built for valuation, plannnig, and and accounting. The balance sheet displays the company’s total assets, and how these assets are financed, through either debt or equity. It can also be referred to as a statement of net worth, or a statement of financial position. The balance sheet is based on the fundamental equation: Assets = Liabilities + Equity. As such, the balance sheet is divided into two sides (or sections). The left side of the balance sheet outlines all a company’s assetsTypes of AssetsCommon types of assets include: current, non-current, physical, intangible, operating and non-operating. Correctly identifying and classifying the types of assets is critical to the survival of a company, specifically its solvency and risk. An asset is a resource controlled by a company which future economic benefit. 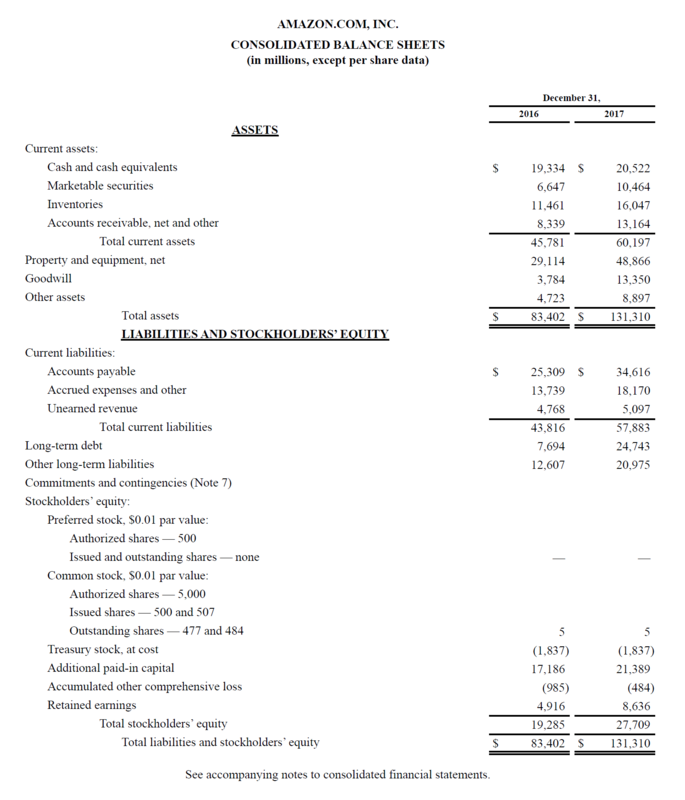 On the right side, the balance sheet outlines the companies liabilitiesTypes of LiabilitiesThere are three types of liabilities: current, non-current, and contingent liabilities. Liabilities are legal obligations or debt owed to another person or company. In other words, liabilities are future sacrifices of economic benefits that an entity is required to make to other entities as a result of past events or and shareholders’ equityStockholders EquityStockholders Equity (also known as Shareholders Equity) is an account on a company's balance sheet that consists of share capital plus retained earnings. It also represents the residual value of assets minus liabilities. By rearranging the original accounting equation, we get Stockholders Equity = Assets – Liabilities. On either side, the main line items are generally classified by liquidity. More liquid accounts like Inventory, Cash, and Trades Payables are placed before illiquid accounts such as Plant, Property, and Equipment (PP&E) and Long-Term Debt. The assets and liabilities are also separated into two categories: current asset/liabilities and non-current (long-term) assets/liabilities. Below is an example of Amazon’s 2017 balance sheet taken from CFI’s Amazon Case Study Course. As you will see, it starts with current assets, then non-current assets and total assets. Below that is liabilities and stockholders’ equity which includes current liabilities, non-current liabilities, and finally shareholders’ equity. View Amazon’s investor relations website to view the full balance sheet and annual report. Enter your name and email in the form below and download the free template now! You can use the Excel file to enter the numbers for any company and gain a deeper understanding of how balance sheets work. Balance sheets, like all financial statements, will have minor differences between organizations and industries. However, there are several “buckets” and line items that are almost always included in common balance sheets. We briefly go through commonly found line items under Current Assets, Long-Term Assets, Current Liabilities, Long-Term Liabilities, and Equity. Learn the basics in CFI’s Free Accounting Fundamentals Course. Cash and EquivalentsCash EquivalentsCash and cash equivalents are the most liquid of all assets on the balance sheet. Cash equivalents include money market securities, Bankers Acceptances, Treasury bills, commercial paper, and other money market instruments. The most liquid of all assets, cash, appears on the first line of the balance sheet. Cash Equivalents are also lumped under this line item and include assets that have short-term maturities under three months or assets that the company can liquidate on short notice, such as marketable securitiesMarketable SecuritiesMarketable securities are unrestricted short-term financial instruments that are issued either for equity securities or for debt securities of a publicly listed company. The issuing company creates these instruments for the express purpose of raising funds to further finance business activities and expansion.. Companies will generally disclose what equivalents it includes in the footnotes to the balance sheet. This account includes the balance of all sales revenue still on credit, net of any allowances for doubtful accounts (which generates a bad debt expense). As companies recover accounts receivables, this account decreases and cash increases by the same amount. Property, Plant, and Equipment (also known as PP&E) capture the company’s tangible fixed assets. This line item is noted net of depreciation. Some companies will class out their PP&E by the different types of assets, such as Land, Building, and various types of Equipment. All PP&E is depreciable except for Land. This line item will include all of the companies intangible fixed assets, which may or may not be identifiable. Identifiable intangible assets include patents, licenses, and secret formulas. Unidentifiable intangible assets include brand and goodwill. Accounts Payables, or AP, is the amount a company owes suppliers for items or services purchased on credit. As the company pays off their AP, it decreases along with an equal amount decrease to the cash account. Current Debt/Notes PayableCurrent DebtOn a balance sheet current debt is the portion of debt due withing a year (12 months) and is listed as a current liability and part of net working capital. Not all companies have a current debt line item, but those that do use it explicitly for loans that were incurred with a maturity of less than a year. Includes non-AP obligations that are due within one year time or within one operating cycle for the company (whichever is longest). Notes payable may also have a long-term version, which includes notes with a maturity of more than one year. This account may or may not be lumped together with the above account, Current Debt. While they may seem similar, the current portion of long-term debt is specifically the portion due within this year of a piece of debt that has a maturity of more than one year. For example, if a company takes on a bank loan to be paid off in 5-years, this account will include the portion of that loan due in the next year. This account includes the amortized amount of any bonds the company has issued. This account includes the total amount of long-term debt (Excluding the current portion, if that account is present under current liabilities). This account is derived from the debt scheduleDebt ScheduleA debt schedule lays out all of the debt a business has in a schedule based on its maturity and interest rate. In financial modeling, interest expense flows into the income statement, closing debt balance flows onto the balance sheet, principal repayments flow through the cash flow statement, completing the scheudle, which outlines all the companies outstanding debt, the interest expense and the principal repayment for every period. This is the value of funds that shareholders have invested in the company. When a company is first formed, shareholders will typically put in cash. For example, an investor starts a company and seeds it with $10M. 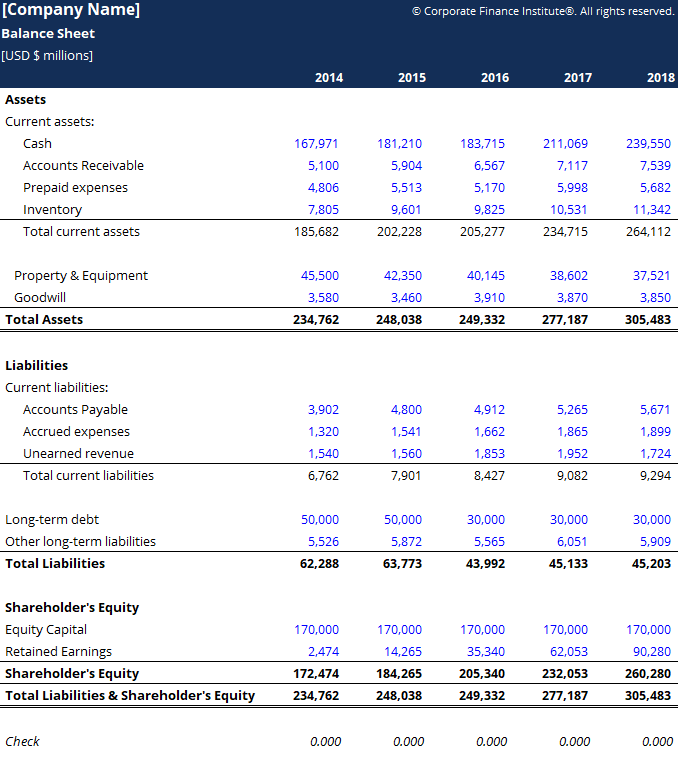 Cash (an asset) rises by $10M, and Share Capital (an equity account) rises by $10M, balancing out the balance sheet. This is the total amount of net income the company decides to keep. Every period, a company may pay out dividends from its net income. Any amount remaining (or exceeding) is added to (deducted from) retained earnings. 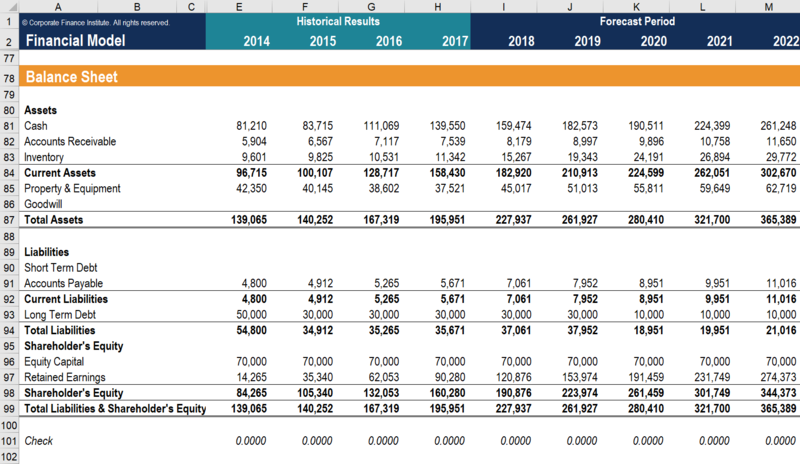 How is the Balance Sheet used in Financial Modeling? This statement is a great way to analyze a company’s financial positionAnalysis of Financial StatementsHow to perform Analysis of Financial Statements. This guide will teach you to perform financial statement analysis of the income statement, balance sheet, and cash flow statement including margins, ratios, growth, liquiditiy, leverage, rates of return and profitability. See examples and step-by-step instruction. An analyst can generally use the balance sheet to calculate a lot of financial ratiosLeverage RatiosA leverage ratio indicates the level of debt incurred by a business entity against several other accounts in its balance sheet, income statement, or cash flow statement. Leverage ratios include debt/equity, debt/capital, debt/assets, debt/EBITDA, and interest coverage. This guide has exmaples and Excel template that can determine how well a company is performing, how liquid or solvent a company is, and how efficient it is. Changes in balance sheet accounts are also used to calculate cash flow in the cash flow statementCash Flow Statement​A Cash Flow Statement (officially called the Statement of Cash Flows) contains information on how much cash a company has generated and used during a given period. It contains 3 sections: cash from operations, cash from investing and cash from financing.. For example, a positive change in plant, property, and equipment is equal to capital expenditure minus depreciation expense. If depreciation expense is known, capital expenditure can be calculated and included as a cash outflow under cash flow from investing in the cash flow statement. Screenshot from CFI’s Financial Analysis Course. The balance sheet is a very important financial statement for many reasons. It can be looked at on its own, and in conjunction with other statements like the income statement and cash flow statement to get a full picture of a company’s health. Liquidity – Comparing a company’s current assets to its current liabilities provides a picture of liquidity. Current assets should be greater than current liabilities so the company can cover its short-term obligations. The Current RatioCurrent Ratio FormulaThe Current Ratio formula is = Current Assets / Current Liabilities. The current ratio, also known as the working capital ratio, measures the capability of a business to meet its short-term obligations that are due within a year. The ratio considers the weight of the total current assets versus the total current liabilities. and Quick RatioQuick RatioThe Quick Ratio, also known as the Acid-test or liquidity ratio, measures the ability of a business to pay its short-term liabilities by having assets that are readily convertible into cash. These assets are, namely, cash, marketable securities and accounts receivable. These assets are known as "quick" assets since are examples of liquidity financial metrics. Leverage – Looking at how a company is financed indicates how much leverage it has, which in turn indicates how much financial risk the company is taking. Comparing debt to equityFinanceCFI's Finance Articles are designed as self-study guides to learn important finance concepts online at your own pace. Browse hundreds of finance articles and guides to learn about the cost of capital, financial analysis, ratios, multiples, rates of return, profitability metics, and how to evaluate the overall and debt to total capital are common ways of assessing leverage on the balance sheet. Efficiency – By using the income statement in connection with the balance sheet it’s possible to assess how efficiently a company uses its assets. For example, dividing revenue into fixed assets produces the Asset Turnover RatioFixed Asset TurnoverFixed Asset Turnover (FAT) is an efficiency ratio that indicates how well or efficiently the business uses fixed assets to generate sales. This ratio divides net sales into net fixed assets, over an annual period. The net fixed assets include the amount of property, plant, and equipment less accumulated depreciation to indicate how efficiently the company turns assets into revenue. Additionally, the working capital cycleWorking Capital CycleThe working capital cycle for a business is the length of time it takes to convert net working capital (current assets less current liabilities) all into cash. Businesses typically try to manage this cycle by selling inventory quickly, shows how well a company manages its cash in the short term. Rates of Return – The balance sheet can be used to evaluate how well a company generates returns. For example, dividing net income into shareholders’ equity produces Return on EquityReturn on Equity (ROE)Return on Equity (ROE) is a measure of a company’s profitability that takes a company’s annual return (net income) divided by the value of its total shareholders' equity (i.e. 12%). ROE combines the income statement and the balance sheet as the net income or profit is compared to the shareholders’ equity. (ROE), and dividing net income into total assets produces Return on AssetsReturn on Assets & ROA FormulaReturn on assets (ROA), a form of return on investment, measures the profitability of a business in relation to its total assets. The ROA formula is used to indicate how well a company is performing by comparing the profit it's generating to the capital it's invested in assets. The higher the return, the more (ROA), and dividing net income into debt plus equity results in Return on Invested CapitalReturn on Invested CapitalReturn on Invested Capital - ROIC - is a profitability or performance measure of the return earned by those who provide capital, namely the firm’s bondholders and stockholders. A company's ROIC is often compared to its WACC to determine whether the company is creating or destroying value. (ROIC). All of the above ratios and metrics are covered in detail in CFI’s Financial Analysis Course. Below is a video that quickly covers the key concepts outlined in this guide and the main things you need to know about a balance sheet, the items that make it up, and why it matters. As discussed the video, the equation Assets = Liabilities + Shareholders’ Equity must always be satisfied!